PROPERTY DESCRIPTION With origins dating to circa 1901 with later additions, this truly spacious home offers traditional living space arranged over two levels and is well proportioned for the growing family. Located in the heart of this sought after commuter village, with local amenities and main-line train station serving London Liverpool Street, this individual property also benefits from a delightful southerly aspect walled garden and double garage. The ground floor accommodation offers: 34' 6" x 18' 4" open plan living/dining room, kitchen/breakfast room opening onto the rear garden and a guest cloakroom. 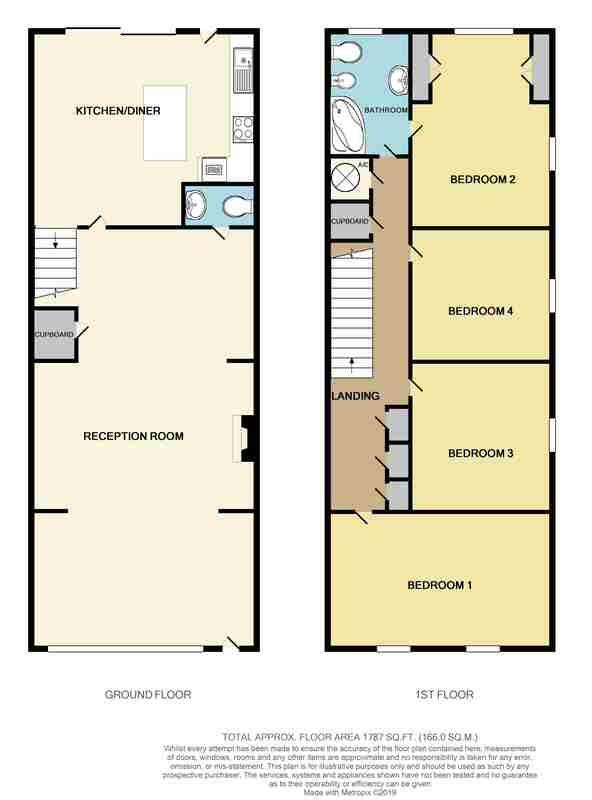 There are four generous double bedrooms to the first floor and a family bathroom. The High Street offers a Co-Op store/post office, pharmacy, doctor and dental surgeries and a selection of pubs/restaurants. The regarded village primary school is set along the Roydon Road. St Margaret's station serves the Hertford East - Liverpool Street line with a change at Broxbourne for Stansted Airport. OPEN PLAN LIVING/DINING ROOM 34' 6" x 18' 4 max" (10.52m x 5.59m) Overall measurement. GUEST CLOAKROOM Fitted with an inset stainless steel sink with work top and cupboards below. Low level w.c. Radiator. Extractor fan. KITCHEN/BREAKFAST ROOM 17' 6" x 15' 8" (5.33m x 4.78m) Fitted with a range of wall, base and larder units with complementary work surfaces over. Tiling to splash-backs. Matching island unit/breakfast bar with cupboards below. Inset one and a half bowl sink and drainer with mixer tap. Built-in electric double oven/grill. Four ring gas hob with extractor hood over. Integrated dishwasher and washing machine. Wall mounted, concealed gas fired boiler. Tiled floor. Radiator. Coved cornice. Stairs rising to first floor. Upvc sliding patio doors plus single door opening onto the rear garden. FIRST FLOOR Spacious landing with five built-in storage cupboards, one being the airing cupboard housing hot water cylinder. 'Skylight' roof window giving natural light. Loft access hatch with pull down ladder. Loft is part boarded with light connected. BEDROOM ONE 18' 4" x 11' 3" (5.59m x 3.43m) Two Upvc double glazed windows to front aspect. Two radiators. Coved cornice. BEDROOM TWO 15' 7" x 11' 3" (4.75m x 3.43m) Dual aspect double glazed windows to rear and side. Radiator. Range of built-in bedroom furniture including wardrobes, over bed storage and drawer units. Door to bathroom. BEDROOM THREE 12' 2" x 11' 11" (3.71m x 3.63m) Double glazed window to side aspect. Radiator. Coved cornice. BEDROOM FOUR 11' 8" x 10' 4" (3.56m x 3.15m) Double glazed window to side aspect. Radiator. Coved cornice. BATHROOM 9' 8" x 6' 5" (2.95m x 1.96m) Fitted with a four piece suite comprising: Panel enclosed corner bath with mixer tap and independent shower over. Low level w.c. Bidet. Vanity wash hand basin with mixer tap and cupboard below. Radiator. Coved cornice. Extractor fan. Double glazed obscured window to rear. Door to bedroom two. EXTERIOR The pretty, southerly aspect walled rear garden is mainly paved for ease of maintenance with raised flower beds and pond. Personal door opening to the garage. Gated side access to South Street.